It's a glorious pumpkin color with brown trim. Nearly every day someone compliments me on it. But that's because they can only see the outside of it. Inside, it's a mess! I've decided that enough is enough. I spend a good bit of time trying to organize things for my family--papers, appointments, records of all kinds, calendars, etc. I'll bet you do, too. During this month of focusing on caring for myself, I've realized that I need to spend some time organizing my own stuff. On her blog, Becky shares her secrets to keeping her purse looking like this. I'm going to take her up on her challenge to get my purse organized. You know, the only person who will benefit directly from this exercise will be me, but that's okay. What I'm realizing this month is that taking care of myself in big ways and small is worth the effort. And there will be indirect benefit for everyone around me: getting my own spaces organized will contribute to my being happy and healthy, which will help me to care for everyone else! How are you at keeping your personal spaces organized? Do you need help in this area as well? Or do you have any ideas to share? This post is the fifteenth entry in a 31-day series: Caring for Myself Body and Soul. Click here for a list of all the posts in this series. 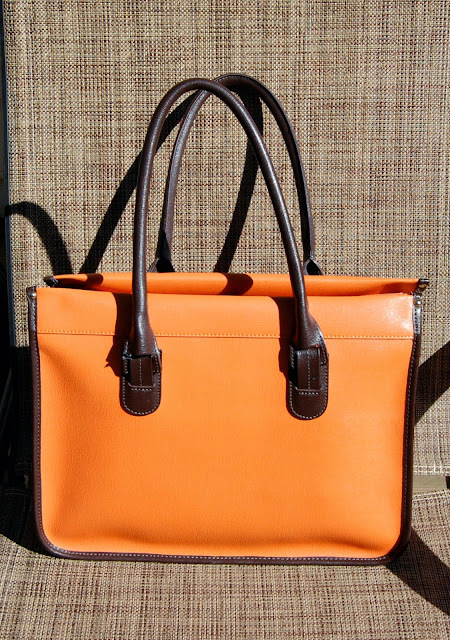 What a lovely orange bag! That certainly looks lovely with about anything this fall season! For the past several years I have owned a couple of purse organizers...you may have seen them on TV or even in the "As seen on TV section of Walmart or drug store. Purse Brite is the first one I got and also had a small LED flashlight built in to find your keys in the dark! I swear by that little thing. 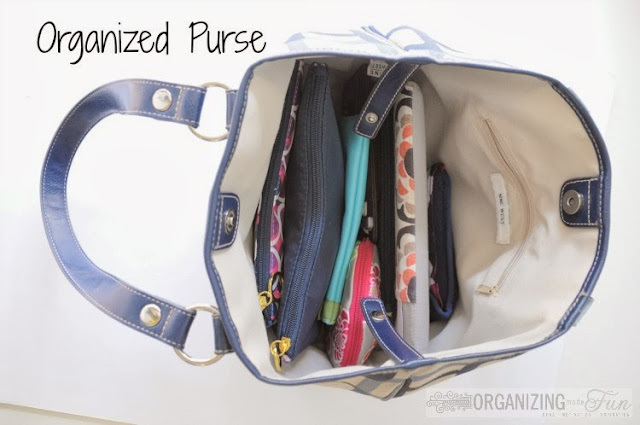 It is got pockets and sections of different shapes and sizes and when you want to change purses, you just grab the whole thing out including everything it's holding and put it in the other purse. You can actually find them all over the internet...that's where I ordered mine...I think it was about $15. I try to clean mine out on Fridays. It is amazing how heavy the darn thing can be when it is full of trash! Love your bag, btw!